And so am I. I did not enjoy Sparkling Cyanide anywhere near as much as other Christie books, and it is one of the very few where I believe that the tv adaptation (either of the two tv adaptations I have seen - one with Pauline Collins and Oliver Ford Davies, and one with Anthony Andrews) were much more engaging than the book. 1. I was bored. This is not a great story to read if you already know who's dunnit. 2. While I liked a few of the characters - Lord and Lady Kidderminster and their daughter and son-in-law Sandra and Stephen Farraday - these characters, in the original, were just no patch on their tv versions - Clare Holman and James Wilby were excellent (!) and I could actually really care for their versions of Sandra and Stephen. Christie's book versions paled by contrast and I was a little disappointed how wooden and stilted their relationship was depicted. 3. There just seem to be way too many characters in this one. Now, this is a perception only. There probably aren't any more characters in this than there are in some of my favourite Christies - Murder on the Orient Express, Death on the Nile or Three Act Tragedy anyone? These have lots of characters but they are very distinct from each other - and they are memorable. The characters in Sparkling Cyanide weren't. If it had not been for Hugh Fraser's lovely narration giving each of them a voice (in a manner of speaking), I would have had no feel at all for who was who. 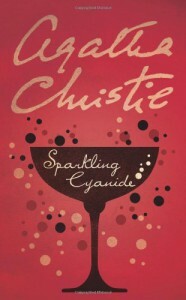 Sparkling Cyanide started life as a short story (The Yellow Iris) and is one of several stories that Christie revised for a longer book. In this case, it didn't work. I actually prefer the short story.